The Detroit court ruling that weakens public pension protections should be a wake-up call for taxpayers and government employees in other states. DETROIT — In a ruling that could reverberate far beyond Detroit, a federal judge held on Tuesday that this battered city could formally enter bankruptcy and asserted that Detroit’s obligation to pay pensions in full was not untouchable. In particular, the Detroit ruling could be a game changer for California municipal bankruptcy cases. The ruling by Judge Steven W. Rhodes, who is presiding in Detroit’s bankruptcy case, that public pensions are not protected from cuts could alter the course of bankrupt cities like Stockton and San Bernardino, Calif., that had been operating under the assumption that pensions were untouchable. Uncertainty looms for Detroit retirees. Are retirees going to lose their pensions? Maybe. Rhodes ruled Tuesday that pensions, like any contracts in bankruptcy, can be broken. But he also warned city officials that they’ll need to justify any deep cuts that could threaten the lives of retired workers. There are about 23,000 retirees and 9,000 city workers. Most of them receive pensions that are less than $20,000 annually. Michigan’s Attorney General Bill Schuette says he will continue to fight Rhodes’ assessment that pensions can be cut, since public pensions are protected in the state’s Constitution. I’m unaware of any New York municipalities or school districts that are in danger of bankruptcy. But with pension costs overpowering the ability of New York public schools to maintain student services and escalating 5,000% over the last decade in some towns, this latest development may diminish the perceived sanctity of guaranteed pension payouts. In any case, it’s hard to see how taxpayers can continue to pay the skyrocketing pension costs that have been the norm in recent years. We will have to wait to see how the pension crisis plays out in New York and other states. Recent reform that saw the creation of Tier 6 is unlikely to offer taxpayers any relief for at least a decade. Over time, lawmakers have passed legislation to reduce the cost of pensions to state and local governments and school districts. The avenue they have used to do this is to create additional “tiers”—levels of membership that carry different benefits and requirements. After the passage of Tier 5 in 2009, calls for pension reform persisted, and a new Tier 6 was enacted this year. Gov. Cuomo has said that the recently enacted pension reform will save the state more than $80 billion over the next 30 years. However, according to the NYS Comptroller’s Office, the creation of Tier 6 will not significantly lower pension costs for schools in the immediate future to prevent the kinds of program cuts many districts face in the next few years. This is because the new pension tier applies only to new employees hired after April 1, 2012. With school districts struggling to balance their budgets in this difficult economy, most are laying off staff rather than hiring new employees who would fall into the new tier. Pension costs have continued to surge out of control, as I wrote last year. … skyrocketing public pension costs are “the single biggest threat” to local schools’ ability to deliver educational services for New York children. In our local district, pension costs have risen more than 50% over the last two years and now account for 7.2% of the total budget, up from 5.1% in 2010-11. This has meant ongoing cuts in student services as taxes are diverted to pay for pensions. The trend is up, and by 2015 pension costs are expected to eat up 35 percent of property tax collections. There is no relief in sight. Teacher pension costs for the 2013-14 school year will rise 37%. ◊◊◊ Washington State’s public pension may be in trouble. The problem, similar to that in other states, has to do with the way pension benefits are valued. “The way to value a stream of promised benefits is with an interest rate that reflects the riskiness of the promised benefits themselves, not the expected returns,” Munnell said. This story is being ‘repeated all across the nation’ according to Walter Russell Mead. … It’s as well-written a summary of a pension crisis story as you’re likely to get, and this is a story that’s being repeated all across the nation. Then, if you haven’t already, have a look at how much you or your loved ones are relying on generous promises made by state bureaucrats to fund your retirement—and start asking some hard questions. ◊◊◊ New York teacher evaluations are a “’grand and costly experiment’ with limited benefits”. ALBANY — New York’s small-city, suburban and rural school districts expect to spend an average of $155,355 this year to implement the state’s new teacher and principal evaluation plans, a report Thursday from the state School Boards Association found. The evaluation system is a requirement for receiving funds from President Barack Obama’s Race to the Top initiative. In 2010, New York was awarded $700 million in Race to the Top grants. About half of the funding will go to local districts over four years to implement the evaluation system and other initiatives. ◊◊◊ 20,000 illegal aliens apply for college financial aid under California’s new Dream Act. The 4.4% increase in school spending proposed by New York Governor Andrew Cuomo is not enough according to some education advocates. Cuomo’s budget plan for the fiscal year that starts April 1 includes a 3 percent increase — about $610 million — in education aid plus $203 million to offset high pension contribution costs. An additional $75 million would go toward initiatives highlighted in his State of the State address. Proposed funding barely allows schools to “tread water”. Governor Cuomo argues that the 8.6% increase in education funding over the last two years has been double the inflation rate. Schools across the state report that steep rises in pension costs more than cancel out any increases in proposed funding. New Paltz Superintendent Maria Rice said teachers’ retirement costs alone at the Ulster County district are growing by about $900,000, so the $333,500 increase won’t come close. The district would get about $12.4 million, a 2.8 percent increase from last year, when including building aid. The county’s average is 2 percent. Based on the aid, Rice projects the district will have to cut between $800,000 and $1 million to balance the budget, which is “luckily” less than last year’s gap, she said. The district cut its pre-K program and increased class sizes this year. Next year, she said she’ll debate whether to cut Advanced Placement courses or eliminate an elementary foreign language program which she said has been successful. Some schools are considering taking advantage of a new “pension-financing plan”. The pension stabilization option would give local governments and school districts a lower, more predictable employer contribution rate over a period of 25 years or more, rather than high bills now and presumably lower ones later. Not everyone believes this new scheme will work, with some calling it a “threat to pension solvency”. The state’s largest public union is right. Gov. Andrew Cuomo’s proposal to “smooth” pensions for local governments and school districts is “a bait-and-switch scheme … that will allow public employers to underfund their pension obligations,” as the Civil Service Employees Association described it last week. Instead of providing real mandate relief to remedy the unsustainable rise in pension costs, the governor is promoting a quick fix that will temporarily hide the problem until a few years down the road when it will resurface. This has become a typical scenario among our politicians. The top job is an air traffic controller,with a median 2010 salary of $108,040. ALBANY, N.Y. – Gov. Andrew Cuomo’s Mandate Relief Council voted down 51 of 65 requests for help from local governments and school districts Tuesday, approving 14 suggestions for review of state mandates for special education and two other school issues…. Requests to reduce the crippling pension costs were among those that were rejected. They rejected requests to reduce the mandate to transport private school students; to reform teacher tenure and “last in, first out” work rules; to change the Triborough Amendment to the Taylor Law that keeps automatic teacher pay raises in place after a contract has expired; and to reduce the cost of public employee and teacher pensions. The requests included letting school districts create pension reserve funds, but that was rejected because it was an expansion of district authority, not a state mandate. Also rejected were local government requests regarding the Wicks public works contracting law, health insurance contributions, restrictions on new unfunded mandates, tax cap exemptions, legal services for the poor and the MTA commuter tax. Staff of the panel said that the rejected requests were beyond the scope and the authority of the council to decide because they were matters of state law, covered by local union contracts, or otherwise not a qualified candidate for elimination or reform. I believe a constitutional amendment is needed to reduce pension costs, one of the most costly state mandates. If that’s the case, the Council could have made that recommendation. You can see a copy of the full report at the Mandate Relief Council site. New York’s highest-salaried school principal, James Ruck, who has led Harrison High since 2006, will earn $245,728 this year, setting a new standard for a building administrator in the nation’s hottest market for education leaders. About 1,000 students attend Harrison High School. But IQ does matter in overall math achievement levels. To their surprise, the researches found that IQ does not predict new learning — in other words, intelligence as measured by the IQ test does not indicate how likely students are to pick up new concepts or accumulate new skills. While children with higher IQs did have higher test scores from the beginning of the study, how much newmaterial the kids learned over the years was not related to how smart they were, at least not once demographic factors were taken into account. In New York, public schools are struggling with rising pension costs and a 2% tax cap as they plan for next year’s budgets. As the situation becomes desperate, one official warns that school security may suffer. School districts face a daunting challenge as they begin drafting budgets for 2013-14: Rising pension costs alone could eat up most or all of their allowable tax-levy increase under the state’s tax-levy cap. “It’s debilitating for us, terrible,” said Thomas DePrisco, a member of the Pearl River Board of Education. Pension costs will increase nearly 40%, forcing cuts in student services. District contributions to the pension system for teachers and administrators are expected to rise close to 40 percent next year. This increase could translate into hundreds of thousands of dollars for small districts and several million for larger districts, which will require raising the tax levy by 2 percent or 3 percent in most districts. Since the state cap starts at 2 percent before adjustments, most districts will not be able to increase spending in other areas, from health insurance to curriculum materials, without making equivalent cuts to programs and staff. Pension contributions will increase to about 16% of payroll costs. Under state law, all school districts outside of New York City must contribute a percentage of their payroll each year to two pension systems, one for teachers and administrators, and one for support staff. The percentages are determined by the two systems’ past investment performances. Next year’s contributions are tied to the period between 2007-08 and 2011-12, when investment returns were down. The New York State Teacher Retirement System recently notified districts that it expects to raise their 2013-14 contribution to between 15.5 percent and 16.5 percent of payroll, up from 11.8 percent of payroll this year. The employer contribution has varied between 6 and 9 percent of payroll in recent years. The TRS fund, which pays pensions to retired teachers and administrators, has $88 billion in assets. It is paying benefits to almost 150,000 people, up from 100,000 in the year 2000. Its active membership — those who will receive future benefits — has increased from 225,000 people in 2000 to 277,273 this year. Schools will start with a deficit. The Valhalla school district expects to increase its Teacher Retirement System contribution by about $930,000 to more than $3 million, while its Employees Retirement System contribution will rise by about $91,000. These increases alone will require raising the district’s tax levy by about 2.5 percent. “We start the budget planning process in a deficit and wonder how we’ll stay under the cap,” Superintendent Brenda Myers said. Teachers’ pensions were protected under the property tax cap legislation but student services were not. The property-tax cap, going into its second year, starts by limiting tax-levy increases to 2 percent, but the number can go up or down depending on several factors. Pension cost increases over 2 percent are exempt from the cap, which is little consolation for districts that are up against the cap anyway. Politician wants to give teachers even more protection. Assemblywoman Ellen Jaffee, D-Suffern, said she is considering proposing legislation that would exempt additional pension costs and perhaps tax certiorari payments from the cap. Ken Slentz, deputy state commissioner of education, said that rising pension and health care costs will result in people losing their jobs so districts can stay under the cap. Recent pension reform had little effect. A key factor is that 86 percent of all teachers and administrators statewide are in Tier 4 of the pension system, meaning that they contribute 3 percent of their salary to the system for only 10 years and nothing thereafter. Tiers 5 and 6, created since 2009, require ongoing employee contributions but currently include only 8 percent of all members. In a low blow that may have been meant to evoke fears related to the recent tragedy in Newtown, one official intimates that school security may suffer. 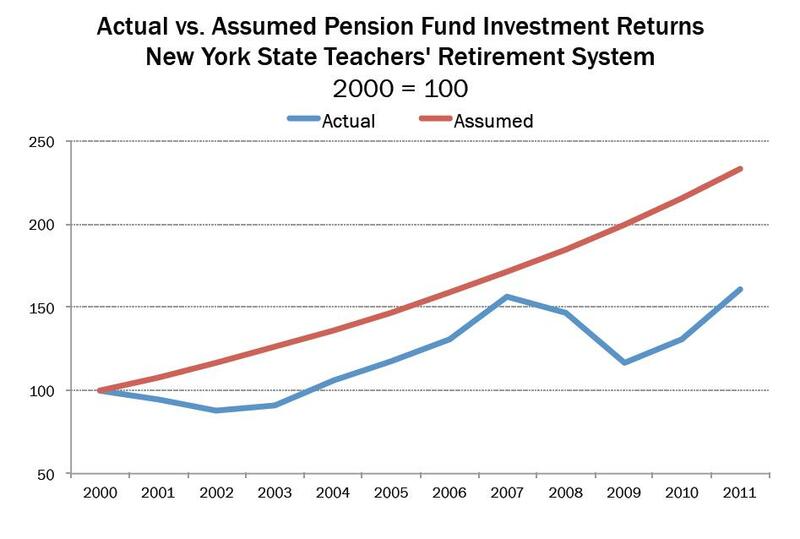 This chart illustrates the teacher pension funding gap that has fallen upon the New York State taxpayers to close. Unrealistically high rates of returns are assumed, but the actual performance comes in significantly lower. Meanwhile, benefit payments have continued increasing at an average rate of 8 percent a year, more than doubling during the same period, according to NYSTRS’ annual financial reports. And this, in a nutshell, is why school districts’ pension costs have risen so much, from an all-time low of 0.43 percent of teacher salaries in 2002 (reflecting double-digit annual returns during the Wall Street boom) to 11.1 percent in 2012. Other New York pension funds have made modest changes in an effort to be more realistic. In a small step toward a more realistic standard, state Comptroller Thomas DiNapoli has lowered the rate-of-return assumption for the giant New York State and Local Retirement System to 7.5 percent, and New York City will soon go down to 7 percent, which is still high enough to have been compared by Mayor Bloomberg to an investment come-on from Bernie Madoff. Meanwhile, the teachers’ pension fund board defends its higher assumed rate of return. The taxpayer contribution for this year increased to about 12% of teacher salaries, and the fund warns school districts that “We anticipate continued future increases in the [rate] beyond this point.” Unfortunately, they do not offer estimates of the increases, but the author sees a rise to 17%. One way for school boards to get some relief from the soaring costs of the pension mandate is to keep salary increases down. … But while school districts complain that pensions are a state-mandated cost over which they have no control, they are not completely helpless – not as group, at any rate. A concerted effort by school boards to hold down salary increases could have a significant impact on long-term pension costs…. 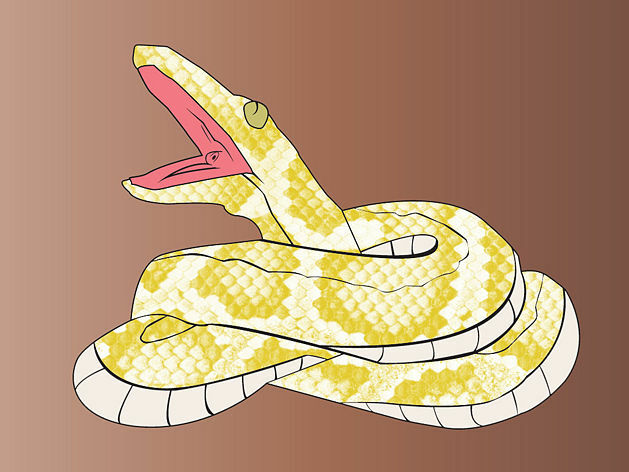 Using an improbably high discount rate is a related problem. In addition to the assumed rate of return, the discount rate is another factor that affects taxpayer contributions to public pension plans. … the discount rate is just an expression of the cost of future liabilities today. And the higher the assumed discount rate, the less money needs to be set aside now to cover benefits promised for the future…. Last week I wrote about the problem with public pension funds using a discount rate that is too high. The Chicago teachers’ strike has entered its second week after teachers decided they need more time to review the tentative contract. Calling the strike illegal, Mayor Rahm Emanuel is asking the court to force the teachers back to the classrooms. The major issues are teacher evaluations, job security, and a longer school day. Chicago public schools have problems. … 99.7% of Chicago teachers are rated satisfactory while the graduation rate is just 60%, only 20% of eighth-graders are proficient in reading and less than 8% of 11th-graders are college-ready on state tests…. … The average Chicago public-school teacher is the best-paid in the country, making between $71,000 (the union’s calculation) and $76,000 (the city’s). And that’s not counting benefits and pensions, paid days off, summer vacation and more. Teachers in New York and Los Angeles earn slightly less, and then the list drops off dramatically, with Dallas and Miami paying around $53,000 on average. Unions are still hallowed organizations in Chicago, and the teachers union holds a special place of honor in many households where children often grow up to join the same police, firefighter or trade unions as their parents and grandparents. The union won the PR battle. To win friends, the union has engaged in something of a publicity campaign, telling parents repeatedly about problems with schools and the barriers that have made it more difficult to serve their kids. They cite classrooms that are stifling hot without air conditioning, important books that are unavailable and supplies as basic as toilet paper that are sometimes in short supply. “They’ve been keeping me informed about that for months and months,” Grant said. It was a shrewd tactic, said Robert Bruno, professor of labor and employment relations at the University of Illinois at Chicago. Even though they may be unhappy with schools in general, parents tend to like the teachers they know. … People generally like their kids’ teachers. Even those who may dislike the union like their teachers. They may agree with the notion of stronger assessments for teachers and perhaps also be against the union call for automatically rehiring those laid-off when vacancies do occur. But they like their teachers and so cast their lot with them. It’s a dynamic at play whenever the under-performing Chicago system, which is beset by huge deficits, tries to close or consolidates schools. The school board usually gets its way but not before a very public uproar. Even parents at what are clearly low quality, poorly performing schools rise to protest. There’s a bond that blinds them to larger realities but ties them to that neighborhood building without any air conditioning. Even after this strike is resolved, serious pension issues portend more education troubles ahead. In Illinois, 71 cents of every new state education dollar goes to teachers’ retirement benefits, not to schools. Earlier this year the state’s cedit rating was downgraded due to pension problems. The teachers’ fund is one of the country’s worst-financed statewide pension systems, reporting that it is only 47 percent funded. And that’s if you buy the system’s rosy accounting assumptions, including that it will achieve 8.5 percent annual returns on its assets. This level is tied for the most aggressive investment assumption among state pension funds in the country, and the fund has had to get creative in an effort to meet it. Pensions & Investments magazine says it has the fourth-riskiest pension investment portfolio in the U.S., with less than 17 percent of its investments in fixed income and cash.